Europe’s 20th century experience of genocide and the failure of political will to stop it still resonates today on the continent, with a hearing in the European Parliament recently reflecting on a particular 21st century barbarism: communist China’s massacre of prisoners of conscience for their transplant organs. The Jan. 29 hearing at the European Parliament was hosted by Edward McMillan-Scott, a vice president of the Parliament and a stalwart supporter of human rights in China. It featured eight speakers discussing various aspects of human rights abuse in the communist country. Some of the most dramatic testimony came from Dr. Enver Tohti, a Uyghur surgeon who in the 1990s personally participated in the organ harvesting of Uyghur prisoners—before those techniques were carried over to the burgeoning Falun Gong prisoner population in 1999 and 2000. Tohti has been interviewed on the topic before, but his appearance on this panel was his first public testimony. In 1995 he had, “under his supervisor’s watchful eye … performed a live surgical extraction of the man’s liver and kidneys,” according to an account by investigative journalist Ethan Gutmann published last year. Gutmann was also in attendance at the panel. He provided a median estimate of 65,000 Falun Gong practitioners having been killed so that their organs could be removed and sold, since 1999. The actual number could be much higher. Falun Gong is a popular Chinese spiritual practice that the communist regime began persecuting in 1999, after the number of adherents surpassed members of the Party. Those in government in major Western countries appear to find disquieting the idea of confronting a communist regime growing daily in international clout, according to Gutmann and other speakers on Jan. 29. In light of such abuses, Kelam accused the international community, broadly speaking, of deliberately putting its head in the sand on the People’s Republic of China question. “Nowadays, when we can’t hide information, we can’t just pretend that we didn’t get information, we do have enough information to draw a conclusion,” he said. The failure to act comes from lack of courage, he said. Kelam drew a comparison between the general approach to China in vogue now, of attempting to deal with human rights abuses quietly, and former British Prime Minister Neville Chamberlain’s weakness in facing a rising Hitler. 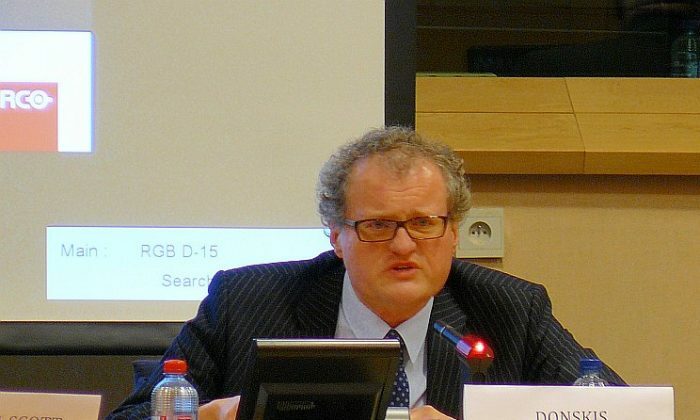 Another member of the European Parliament, Leonidas Donskis, presented a talk called: China’s alternative version of modernity as a threat to human rights.